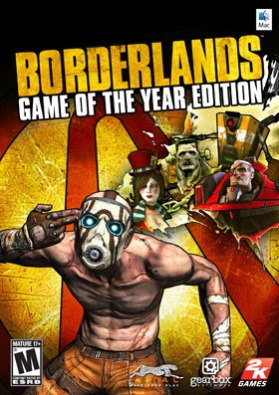 ABOUT THE GAME	Borderlands GOTY Edition includes all 4 of the add-on packs so that you can enjoy all of the content from one of the Most Acclaimed Games of 2009 in one sweet package. Planet Pandora is a sparsely populated wasteland where the rule of law gets rewritten daily in the smoke of the last gun battle. Civilization consists of small outposts on the fringe of human influence, in an a… rea called the Borderlands. Pandoraʼs one tourist attraction is a mythical Vault supposedly packed with fantastic riches.Fortune hunters, corrupt corporate mercenaries and lowlife hoodlums roam the landscape, searching under every grain of sand for the treasure. Since most intelligent life on Pandora has the occupation of Vault Hunter, society has gone to hell - making the outposts and outback areas more than just a little dangerous. KEY FEATURES	Unique hybrid role playing shooter that combines frantic first-person shooting action with accessible role-playing character progression. Super sharp graphics style gives Borderlands a unique comic book come-to-life look. Co-op Frenzy – drop in and out with up to 4 player co-operative for a maniacal multiplayer experience Millions of randomly generated guns! Choose your weapon from rocket-launching shotguns, enemy-torching revolvers, and tons more. Huge single-player game with four playable characters and endless replayability. Contains all 4 add-on packs adding enormous value to an already amazing game.SYSTEM REQUIREMENTS Minimum Processor: 1.4Ghz OS: Mac OS X 10.6.4 RAM: 1GB Free Space: 10GB Graphics: 128MB Accessories: Keyboard	Recommended Processor: 2.8Ghz OS: Mac OS X 10.6.4 RAM: 2GB Free Space: 10GB Graphics: 512MB Accessories: Game Pad	Requires an Intel processor. The following cards are NOT supported: ATI X1xxx series, NVIDIA 7xxx series and Intel GMA series. © 2010 Gearbox Software, LLC. Published and distributed by 2K Games under license from Gearbox Software, LLC. Borderlands and the Borderlands logo are trademarks of Gearbox Software and used under license. 2K Games and the 2K Games logo are trademarks of 2K Games in the U.S. and/or other countries. Gearbox Software and the Gearbox logo are registered trademarks of Gearbox Software, LLC in the U.S. and/or other countries. Uses Scaleform GFX © 2010 Scaleform Corporation. Scaleform GFX is a registered trademark of the Scaleform Corporation. Unreal® is a registered trademark of Epic Games, Inc. Unreal® Engine, Copyright 1998-2010, Epic Games, Inc. Uses FMOD Ex Sound System © 2010 Firelight Technologies. All rights reserved. FMOD Ex Sound System is a registered trademark of Firelight Technologies. All other copyrights or trademarks are the property of their respective owners and are being used under license. All rights reserved. The content of this videogame is purely fictional, and is not intended to represent or depict any actual event, person, or entity. Any similarity between any depiction in this game and any actual event, person or entity is purely coincidental. The makers and publishers of this videogame do not in any way endorse, condone or encourage engaging in any conduct depicted in this videogame. The ratings icon is a trademark of the Entertainment Software Association. Mac and the Mac logo are trademarks of Apple Inc., registered in the U.S. and other countries. Feral and the Feral logo are trademarks of Feral Interactive Ltd.